Zen Buddhism teaches us to be mindful. Certainly, part of the lesson of mindfulness is learning to not tromp around like a bull in a china shop. Clearly, when using this particular teapot, that lesson must be observed. 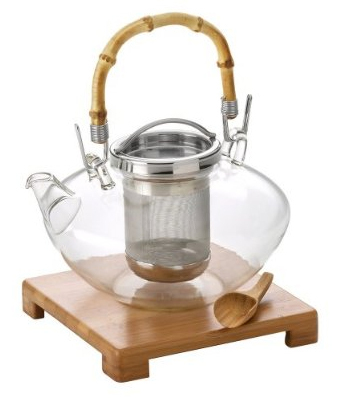 Delicate in nature, this Bonjour Zen Glass Teapot with Glass Infuser makes for an elegant display of tea service. The integrated infuser steeps loose-leaf tea, while the included wooden stand prevents stains by raising the teapot off of the table. Tea, as is life, is fleeting. Enjoy it while it lasts, or breaks—whatever the case may be.